Quick overview The hungry king needs a new cook, but will he ever find someone who can make his favourite dish? A deliciously funny cooking adventure from the stellar picture-book partnership of Julia Donaldson and David Roberts. Who needed a cook like anything . . .
. . . but the king is very fussy; he tries all the cooks in the kingdom, but no one is good enough. Then he spots Wobbly Bob. Maybe Bob can whip up his favourite dinner? But how will Bob be able to cook for the king when he's scared of . . . well, everything?! Discover how the hungry king helps Wobbly Bob face his fears on a cooking adventure across the land and sea. 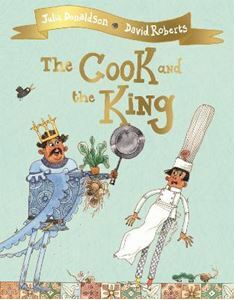 The Cook and the King is a brilliantly funny story from the award-winning picture book duo Julia Donaldson and David Roberts, creators of Tyrannosaurus Drip. With fun rhyming verse and richly detailed illustrations, this is sure to become a firm favourite with children and adults alike. Enjoy more stories from Julia Donaldson and David Roberts: The Troll, Tyrannosaurus Drip, Jack and the Flumflum Tree and The Flying Bath.